Curator’s tour: FRI, November 2, 5pm. For full list of events, see our Events page. This annual showcase features work by seniors in the Sage College of Albany Art + Design BFA programs: Fine Art, Photography, Interior + Spatial Design and Graphic + Media Design. The Annual BFA Exhibition offers a glimpse of the best of what the BFA programs at Sage have to offer. Join us in the Little Gallery on the Sage College of Albany campus for an exhibition featuring work of this year’s 15 Masterclass: Photography students. Masterclass at Opalka is a competitive, advanced art class for Capital Region high school students.This year’s Masterclass included students from Albany, Colonie Central, Colombia, Niskayuna, Schalmont, Shaker, and Shenendehowa High Schools and the Academy of the Holy Names. Congratulations to our Masterclass students! Sage Art+Design Professor Melinda McDaniel taught this class. Phyllis Galembo, “Man with Skull Plaque, Mexico,” 2013. Courtesy Steven Kasher Gallery. Paper Is Part of the Picture is an exhibition, curated by Paul Shaw, about the evolution of paper promotion over the course of the past 125 years as seen through the archives of the Strathmore Paper Company. The company, founded in 1892 and now owned by Mohawk, pioneered the notion of paper as an essential visual and tactile aspect of a printed piece, rather than a simple commodity. It did so by embracing artists and designers as collaborators. Strathmore’s paper promotions reflect the changing trends in American graphic design across the 20th century from Arts & Crafts to the digital era. Among the designers on display are such luminaries as Will Bradley, T.M. Cleland, W.A. Dwiggins, Lucian Bernhard, Lester Beall, Milton Glaser, Seymour Chwast and Marian Bantjes. Paper is a substrate. It can be appreciated for its texture, its rattle, its pliability and its color. But for paper to truly come to life, it must become a surface for the addition of words and images. Although this seems obvious today, in the 1890s American papermakers promoted their papers principally for their printing, folding and mailing abilities. 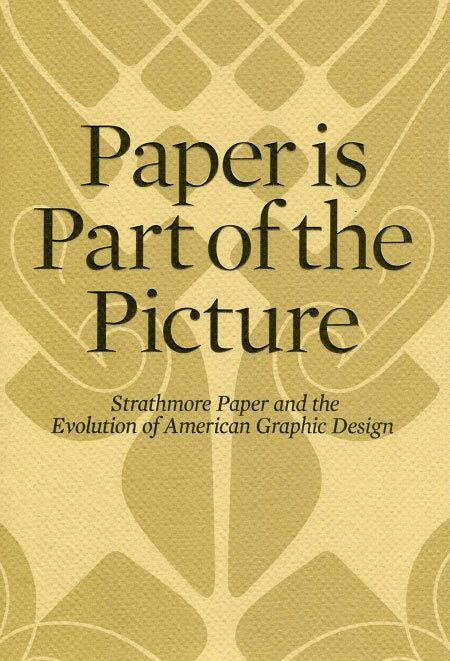 That all changed in 1895 when Horace A. Moses, founder of the paper company that would later become Strathmore, commissioned famed American designer Will Bradley to create a sample book for the Strathmore Deckle Edge Book Paper. Bradley understood that paper was an integral part of printed design, and his innovative promotions marked the beginning of a fascinating partnership between Strathmore and artists, designers and advertising professionals. The notion that “Paper is Part of the Picture,” a slogan coined by Strathmore in 1921, has embodied the company’s promotional efforts for over a century. Many of these promotional efforts along with numerous sample books survive as The Strathmore Archive at Mohawk. Collectively they represent a rich repository of graphic artifacts that provide a new perspective on the past 125 years of American graphic design. They are also a reminder that, even in our digital era, much design remains physical and tactile. This catalog is printed as a portfolio with 19 unbound leaves featuring text by Paul Shaw on one side and reproductions of artwork by Lester Beall, Simms Taback, W.A. Dwiggins, Will Bradley and more. Kathryn Field’s work has been exhibited in galleries and museums across the county and in Sydney, Australia. Last fall, her commissioned sculpture “Celebration” was installed in the Shea Learning Center on the campus of Russell Sage College in Troy, a gift from Donna Robinson Esteves, Russell Sage College alumna and member of the The Sage Colleges Board of Trustees. We present this exhibition in honor of Susan C. Scrimshaw, PhD, who stepped down in June 2017 after serving as President of The Sage Colleges since 2008. This annual showcase features work by seniors in the Sage College of Albany Art + Design BFA programs: Fine Art, Photography, Interior Design and Graphic + Media Design. The Annual BFA Exhibition offers a glimpse of the best of the best of what the BFA programs at Sage have to offer. The Opalka Gallery is pleased to host the 18th Annual High School Regional Juried Art Exhibition presenting artwork by students from 20 regional high schools. The exhibit runs Wednesday, March 22 through Sunday, April 23. At a reception on Friday, March 24, Juror and Sage College of Albany Dean Jean Dahlgren noted the impressive talent on display and the difficulty of being able to only choose 1/3 of the work submitted. On the jury panel, Dahlgren was joined by Daniel Goodwin, artist and Head of Photography and Related Media in the Department of Art and Art History at the University at Albany, and Elizabeth Greenberg, Director, Opalka Gallery at The Sage Colleges. The Albany Academies, Albany City Schools, Averill Park, Ballston Spa, Bethlehem, Burnt-Hills-Ballston Lake, Cairo-Durham, Doane Stuart, East Greenbush, Emma Willard, Greenville, Guilderland, Ichabod Crane, Mohonasen, Niskayuna, North Colonie, Schenectady, Schodack, Scotia-Glenville, Shenendehowa, Voorheesville. Born in Austria, schooled in Paris and Italy and now living in upstate New York, Caroline Ramersdorfer is influenced by a sense of place. Starting with huge blocks of marble, granite and other stone, Ramersdorfer carves intricate interiors as if from the inside out, harnessing light and the material’s innate properties. She works in contrasts—smooth and rough, architectural and organic—to create sculptures that simultaneously appear grounded and weightless. Siona Benjamin’s boldly colorful work reflects her transition between worlds as she attempts to create a dialogue between the ancient and the modern. Originally from Mumbai, now living in the US, Benjamin holds MFA degrees in both painting and theater set design. Her multimedia work reflects her background as a Jewish Indian woman raised in a predominantly Hindu and Muslim India and educated in Catholic and Zoroastrian schools. Inspired by traditions as diverse as Indian miniature painting, Byzantine icons, illuminated manuscripts, and American Pop Art, she combines the imagery of her past with the role she plays in America today, making a mosaic that includes cultural, religious, and feminist narratives. The show will also feature an interactive installation, My Magic Carpet, a gold tent 11 feet in diameter into which viewers will be invited to recline. The recipient of two Fulbright Fellowships, Benjamin has exhibited widely and has been featured in The New York Times, The Chicago Tribune, and Art in America. This annual showcase features work by seniors in the Sage College of Albany Art+Design BFA programs: Fine Art, Photography, Interior Design and Graphic + Media Design. All seniors take a Capstone class which focuses on a personal direction in the major in preparation for this exhibition. Selections are made by a jury of faculty and the Opalka Gallery director. As such, the Annual BFA Exhibition offers a glimpse of the best of the best of what the BFA programs at Sage have to offer. London-born, New York City-based artist Kate Teale makes atmospheric paintings and large-scale drawings of waves, bedsheets, and windows. She works in oil, watercolor and graphite to create images that float between figuration and abstraction. Whether with smaller works on canvas or large-scale site-specific drawings, one of which she’ll create in the gallery, she mines imagery that swings from the private to public, specific to universal but all loaded with meaning. Teale was educated at Oxford University and City and Guilds of London Art School before receiving her MFA from Hunter College/CUNY. Her first solo show in NYC was at Spring Gallery in 1996 and she’s since shown at AIR Gallery, Monya Rowe Gallery, Jim Kempner Fine Art, Kristen Frederickson Contemporary Art, the Richmond Center for the Visual Arts at Western Michigan University, and Hampden Gallery at UMass, Amherst among other places. She’s the recipient of a Painters and Sculptors Grant from the Joan Mitchell Foundation and a NYFA Fellow. She’s also a writer, curator and founder of the Big&Small/Casual Gallery in Long Island City. “The Housed” travels to Opalka Gallery from Western Michigan’s University’s Richmond Center for Visual Arts where it was curated by Don Desmett. Published by Western Michigan University with essays by Lucy Lippard and Sarah Schmerler and an interview with the artist by curator Don Desmett. Video games have come a long way since Pong; the video game is an artistic medium all its own now. “From Concept to Console” looks at art in video games, pulling back the curtain to reveal the process of how it is conceived and created. It’s an examination of the creativity, diversity, and wide range of artistry that spans many disciplines in a medium that is, in some ways, still in its infancy. “Our goal from the outset was to move past the outdated question of whether video games can be considered art because we believe that, emphatically, they can be. Instead, we wanted to highlight games that we think are pushing the medium forward – those that display the highest levels of artistry – and the artists who contribute so much to the final product,” notes co-curator and Opalka Director Elizabeth Greenberg. The seven games from six different studios appearing in the exhibit reflect the spirit of conceptual problem solving and aesthetic beauty in a multitude of ways that embody the range of talent, skills, interests as well as the cultural backgrounds of the artists who created them. Though new artistic territory in the technological age is being explored here, the aesthetic sensibilities are grounded firmly in the past. Influential painters such as Salvador Dali, John Singer Sargent, Otto Dix and Gustav Klimt inform the artists and much of their work makes use of traditional drawing, painting theory, sculpture and even origami. “Gamer or not, everyone will be able to appreciate the range and beauty of the works on display as well as the talent of the artists who made them,” says co-curator Edward Ticson. Some of the best work and artists of the last ten years will be showcased, including the singular talents behind the games Machinarium, Botanicula, Skylanders: SWAP Force, The Dream Machine, The Unfinished Swan, Transistor, and Tengami.